One of the most unique bath rugs in our collection. 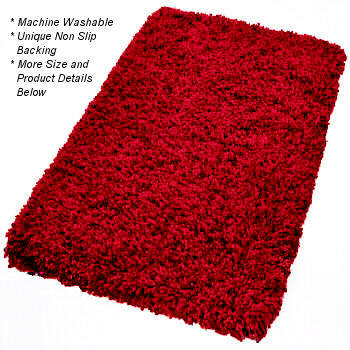 This super soft polyacrylic shag bath rug is available in range of sizes and very exciting colors. High quality, very soft long shag rug with a 37mm / 1.46in pile height. These are long and SUPER SOFT 1/4in thick strands. The long fibers move with ease and are not stiff. Designed and produced by well-known German brand Kleine Wolke, established in 1968, and is backed by their quality guarantee.. Individually tufted and made of soft, long wearing, durable polyacrylic yarn. Garnet Red: The long and thick shag fibers in this rug design are in more than one color thread giving it dimension. The Garnet Red has a red and a deeper red burgundy mingled color range. Saffron: The long and thick shag fibers in this rug design are in more than one color thread giving it dimension. The Saffron has a sunshine warm orange yellow mingled with a medium tone yellow. Eggplant: The long and thick shag fibers are in more than one color thread giving it dimension. The Eggplant has a medium tone plum purple and a deeper dark purple mingled color range. Sorrento Azure Blue: The long and thick polyacrylic shag fibers are in more than one color thread giving it dimension. The Sorrento Azure Blue has a bright medium tone blue and a dark blue mingled color range. Clover Green: Mingled color shag. Clover or subtle grassy green color and a lighter yellow green thread gives this rug some punch. Anthracite Grey: Multi color shag bath rug with two thread colors including a deep grey tone and a light grey. 1.46in long and 1/4in thick polyacrylic noodles.